Desert Treasure Slots - Review it before you play to WIN! Step 1 – Choose how much you wish to wager, with the coin buttons to the left and right of the wagered amount. Click the plus sign to increase your wager, or the minus sign to decrease it. The minimum wager that can be placed is fixed at £0.01p whilst the maximum that can be bet is £5. You will need to place the maximum bet of £5, and have all of the pay-lines activated to be in with a chance of winning the grand jackpot. Step 2 – In order to select how many pay-lines you wish to play with, click on the select line button. Every time you click the button another pay line is added to your game. If you wish to add all of the pay lines immediately, you can simply click bet maximum, to have everything enabled with the highest bet possible in Desert Treasure Slots. Step 3 – Desert Treasure Slot is not difficult to play at all. Once the reels have stopped spinning, any winning pay lines will flash and the sum will be instantly credited to your playing balance. There is also a handy pay table for you to consult, to find the ins and outs of every possible winning combination. Desert Treasure Slot Machine is one of the best Desert Treasure games available in Online Casinos today. 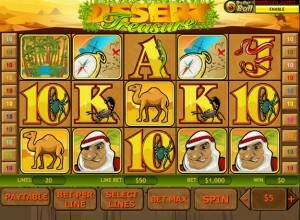 Desert Treasure Slots is based loosely on some of the most beloved images one might associate with a hot sandy desert. This fairytale slots game comes from Playtech, one of the leading developers in Online Gaming software. The icons used on the reels in Desert Treasure Slot are perfect examples of this symbolism. Camels, Snakes, Pocket Watches, X Marks The Spot Maps, Scarab Beetles, Scorpions, Arabian Men and the wild card Cobra are all common images associated with such a locale, and used in this game. Desert Treasure Slots very colourful yellows and oranges make the game visually appealing whilst the grand prize of 10,000 coins only adds to that. Desert Treasure Slots is a fun game for gamers of all types. Whether you are into adventure games, or just old fashioned straight forward slot fun, this slot from Playtech is quick to learn, lots of fun, yet still offers the intrigue of bonus, wild and scatter cards for the more advanced gamers. Desert Treasure Slots free can also be played on the internet to give you ample practice time, allowing you to familiarise yourself with the game, before you wager any of your money. This Desert Treasure Demo Slot is also a great way to learn the pay table and show you what it is you'll need to get if you are going to win!